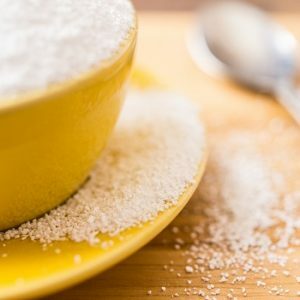 With nearly 40% of the world’s population now classified as obese, and increasing evidence pointing to sugar as the culprit, people are turning to foods that contain low-calorie sweeteners to give them the sweet taste they enjoy, without the risk of gaining weight. However, new research from George Washington University in the US suggests that artificial sweeteners may actually increase a person’s risk of becoming obese. The obesity epidemic is caused by an increase in fat and sugar in people’s diets. Fat accumulation in obesity increases the chances of getting type 2 diabetes, heart conditions and cancer. As such, new guidelines from Public Health England encourage the public to buy lower calorie and lower sugar products. So changing our diet to include low-calorie sweeteners, such as sucralose and aspartame, should be a good way to get all the sweet taste without any of the guilt. Instead, the new study suggests that eating these sweeteners could do the opposite and increase the chance of us accumulating fat in our bodies, in a “dose-dependent” fashion. In other words, the more artificial sweetener you consume, the more fat your body creates and stores. » Including more low-calorie sweeteners, such as sucralose and aspartame, in the diet has long been recommended as a way to assist weight loss. » But recent research has found that the artificial sweetener, sucralose, commonly found in diet foods and drinks, promotes the accumulation of fat in cells by increasing levels of a substance called GLUT4. » This is the latest in a series of recent studies to show that sugar substitutes actually contribute to weight gain. For many years, we have known that sweet substances (sugars or artificial sweeteners) bind to sensors in our mouth called “sweet-taste receptors”. These receptors send a message to our brain to tell us that we are eating something sweet. In the last decade, these sensors have been found in other parts of our body, such as the bladder, the lungs and even in bones. This has raised questions about what effect sweeteners, and these sweet taste receptors, could be having inside our bodies. The new research, results of which were presented at ENDO 2018, the 100th annual meeting of the Endocrine Society in Chicago, looks at the effect that artificial sweeteners have on the cells that make up our fat stores. These cells have a glucose transporter (a protein that helps glucose get into a cell) called GLUT4 on their surface and, when we eat more sugar, the cells take up more glucose, accumulate more fat and become larger. The researchers in this latest study found that the artificial sweetener, sucralose, commonly found in diet foods and drinks, increases GLUT4 in these cells and promotes the accumulation of fat. These changes are associated with an increased risk of becoming obese. Indeed, the research studied a small number of obese people who consume artificial sweeteners and found that they had more of these fat cells and increased expression of genes associated with fat production. When consumed in low quantities, artificial sweeteners have been shown to aid weight loss, improve metabolic conditions and even protect against injury during infection. However, this new study suggests that, rather than keeping us healthy, artificial sweeteners, especially when consumed in larger doses, could be contributing to the obesity epidemic. Given the limited number of studies on the subject – and that few studies compare low-calorie sweeteners with sugar – we do not yet have clear answers. However, with a supply of new, natural sweeteners on the market, such as stevia and monk fruit, we have plenty of them to choose from. These are based on fruit extracts and are aimed at providing a more natural approach to improving the tastiness of food and drink compared with their artificial counterparts. However, it’s too early to say whether these natural products are a safer option than artificial sweeteners or whether they, too, have the potential to increase the risk of obesity. This article was originally published at The Conversation. It is reproduced here with permission.